My boyfriend and I make our way down from Kicking Horse Mountain Resort on a fly-by-the-seat-of-your-pants trip (which involves the Grizzly Bear Refuge at Kicking Horse Mountain Resort, an Aerial Park, unbelievable Whitewater Rafting and 10k Mudd, Sweat & Tears Obstacle Course Race in Fernie, BC.) to Kimberley, BC. It is shocking how much the scenery changes from the sharp, striking mountain ranges near Golden, to the more gentle slopes and wide valleys of the lower East Kootenays. We drive through the unique Bavarian town of Kimberley (probably the cutest town ever) up to Kimberley Alpine Resort, where Trickle Creek Lodge is located at the base of the mountain. 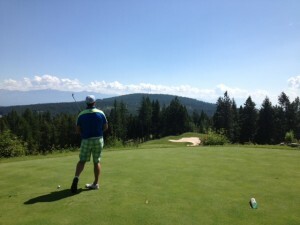 After swimming in the pool and soaking in the hot tub in the 37°C summer heat, we headed to Montana’s Cookhouse on the mountain for dinner and turn in; too excited for our early morning tee time at Trickle Creek Golf Course. and Kimberley Alpine Resort in the winter. If you haven’t met Jeff, you should stop in and pay him a visit; his positive attitude and (almost obsessive but completely warranted) love for golf is infectious. After grabbing our cart and hearing the rules and tips from Dan for the course, we are finally off! Jeff tells us that the course is designed by famous architect, Les Furber, who has designed golf courses not only all across Canada, but throughout Europe, England, the US and even a couple courses in Morocco and Cuba. We also learn that the golf course is the type that video games like Tiger Woods Golf model the games after. The course is absolutely wonderful. We were meant to only play the front 9, but by the time we got to the third hole we decided to play the full course (and sip on some refreshments from the beverage cart of course). Around Hole 4, we look over to our left to a mother deer and fawn prancing through the trees in between the greens. While Taylor and I stared on in awe, Jeff didn’t seem to blink an eye and mentioned the frequency at which that happens. I guess had never realized how much deer loved golf. 18 holes ended too quickly, but our time was up. We headed down to the Platzl in Kimberley to a highly recommended Kimberley Burrito Grill, which served only burritos and quesadillas. Sometimes the best restaurants are those with a small menu and perfected items – this is definitely one of those times! Needless to say, we can’t wait to get back to Kimberley and golf the world class Trickle Creek Golf Course once again and experience more of what this area has to offer.